Double Sided Digital Door Lock Tools - Buy It Now! 2230DC Series Double-Sided Spring Latchbolt Pool/Garden Gate Lock. PLEASE NOTE: Available in the following six colors: Antique Brass, Bright Brass, Jet Black, Satin Chrome, Bright Chrome and white (not pictured). Choose Spring Latch Size 2 3/4 or 2 3/8 at checkout. Also large grip handles are also available. Choose at checkout. garden gates , patio door locks data centers, just about any hinged door or gate that needs access restricted from both sides. This lock can be programmed with same or different combinations on either side. This lock has a spring latch bolt that will automatically lock itself when the gate is closed. To unlock, simply enter your secret code and turn the knob to retract the spring latch. You'll never again worry about your keys being lost, stolen or copied. You can lock or unlock without a key. You don't need AC power, wires, or batteries. You won't be locked out during power failures. And best of all, this lock is not expensive, especially compared to the competition. This keyless combination digital door lock has an elegant design, completely weatherproof finishes, and pick-proof deadbolt security. It installs in minutes, operates easily, and you can change the combination quickly. This double-sided keyless combination spring latch bolt lock is most commonly used on play areas, pool gates, garden gates, or fences, in short, any access door that requires a combination to enter AND to exit. To install, simply remove your existing lock and deadbolt from the top hole of your door and replace it with this lock. Then, in the bottom hole, install a matching lever or knob passage set as featured on our home page. It is as simple as that. Full installation instructions come with each purchase. Using all our keyless digital locks is quick and easy. 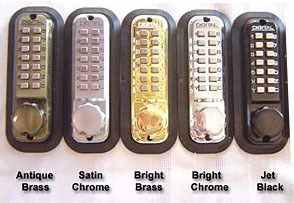 To unlock, simply type in your secret code on the keypad and turn the knob to retract the deadbolt or spring latchbolt. As with all our keyless digital locks, this lock is all mechanical and requires no keys, wires, or batteries to operate. This lock is completely weatherproof and can withstand all types of weather. Note 1: With this keyless entry lock, we recommend also ordering the oversize knob to allow you to grip and pull the door or gate open more easily, as the turn knob is not doorknob size. Note 2: For safety reasons, we recommend NOT using this lock on exit doors that require emergency exiting.